Our favourite Fresh Fruits Lab (FFL) is back at it again. They have opened a second cafe—Fresh Fruits Lab Z Edition—in Clementi just behind NUS. The new outlet is nothing short of amazing. Just like their previous branch, they stick to the core of incorporating fruits into their menu as much as possible, being kid-friendly, and serving up absolutely delicious food at even more reasonable prices than before. We already know what’s great at their first branch, so what is it about The Z Edition that makes it fantastic? A bouncy castle for kids during the weekends! And on top of that, there are some tweaks to the menu and here is everything we love. 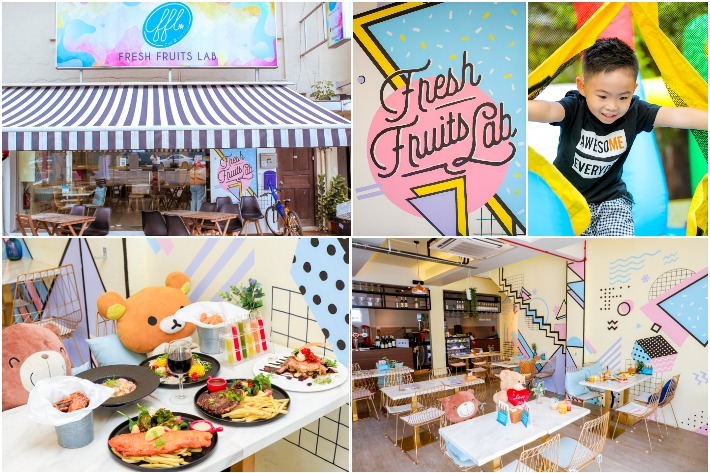 From now until 30 Nov 2018, kids below 8 dine for free during weekends at Fresh Fruits Lab Z when you quote ‘ladyironchef’. Every order of a main course comes with a complimentary kid’s main (from the kids’ menu). 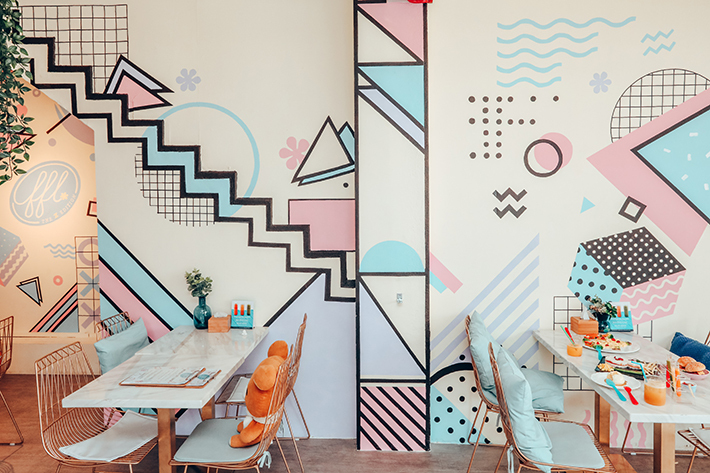 Calling all mommies: this is also the next brunch spot you must bring your kids to for a jolly good time! Just like before, FFL serves their signature cold-pressed juices in a small test tube for you to sample, and in an adorable beaker should you order the full-size ones (averagely S$5 per glass). We ordered the Spam Fries (S$8) as well as the Golden Brown Chicken Wings (S$8)—both served with homemade sweet chilli sauce. The chicken wings had a lovely crispy skin that readily soaked up sweet garlic taste of the chilli. It was well seasoned down to the bone, and juicy without being oily. The light batter coating the spam fries also had an interesting texture to it, that provided a pleasant contrast between it and the soft spam inside. Despite being deep fried, it wasn’t greasy at all. We’ve said it before, and we’ll say it again. The Classic British Fish and Chips (S$12) is our all-time favourite main at FFL. As plain and boring as it sounds, the portion size is massive, and the fish remains firm, flaky and delicately soft, encrusted by a thin layer of white ale batter. Their homemade tartar sauce boasts a slight spice to it that made the whole dish even more enjoyable. As if the generous serving is not filling enough, it comes with a side of fruit salad and truffle fries. Another main to try is the FFL Baked Rice (S$9). The rice is cooked in buttermilk before being baked with a layer of mozzarella cheese, and it is pleasantly cheesy without being cloying or heavy. With bacon, chicken ham and mushrooms in it, kids are bound to love this dish of baked rice for sure! The Grilled Pork Loin (S$15) is also a chef’s recommendation. Tender, thick and juicy, each morsel was a delight in itself to eat. Served with mashed potatoes, eggplant pesto and green zucchini, the flavours intermingled with one another to highlight and emphasize the natural sweetness of the meat. It also comes along with pesto mayo sauce and apple chutney that helped to change up the flavour profile as we ate it. Cafes are usually not known for their steaks, but FFL’s Angus Rib Eye (S$22) is definitely worth its price. It is a genuine 250gm of Angus ribeye that’s tender and soft, with the perfect amount of chew before easily sliding down your throat. We loved how with every chew it released more of that beef flavour we all know and love, which melded well with their brown sauce that was slightly sweeter than the typical chargrill or mushroom sauce. We also enjoyed their Cajun Chicken (S$10), which is really a simple yet comforting roasted cajun chicken served with grilled vegetables, sweet corn and mashed potatoes. Just like their first branch, FFL aims to cater to the entire family. 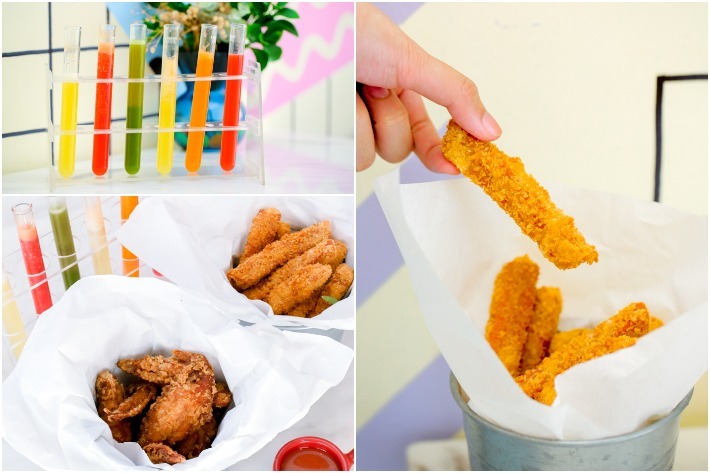 Treat your kids to deliciously adorable meals such as FFL’s Teddy The Daddy (S$8), Little Miss Koala (S$8) or Chicken Little (S$10). Their kids’ menu is prepared with less salt, without compromising on any of the other flavours for the children to enjoy. That is, if they’re willing to cut into something so cute. 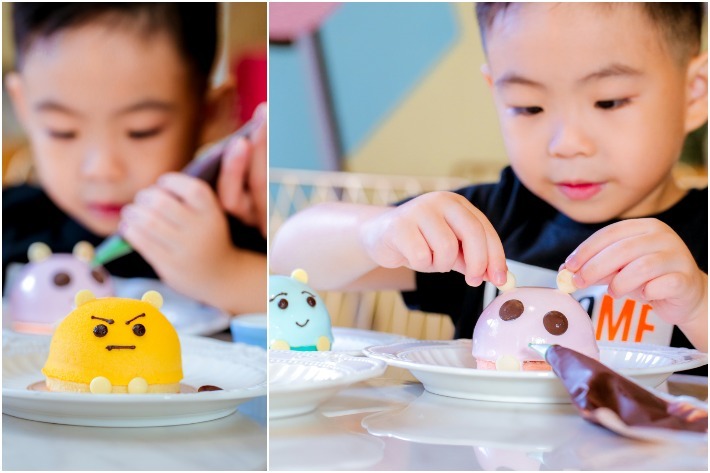 They also offer cake decorating to allow your kids to have a hand at crafting their own desserts. Choose from a range of their signature and have your children’s creativity flow from the tip of their chocolate pens. For those kids that just can’t sit still, there’s a bouncy castle out in their backyard—set up at Fresh Fruits Lab Z on weekends. Boy, won’t the kids get so excited about this! Your kids will absolutely love the bouncy castle where they can bounce and run back and forth. Fresh Fruits Lab Z Edition is the perfect place for parents to kick back and relax with good food while their children entertain themselves. 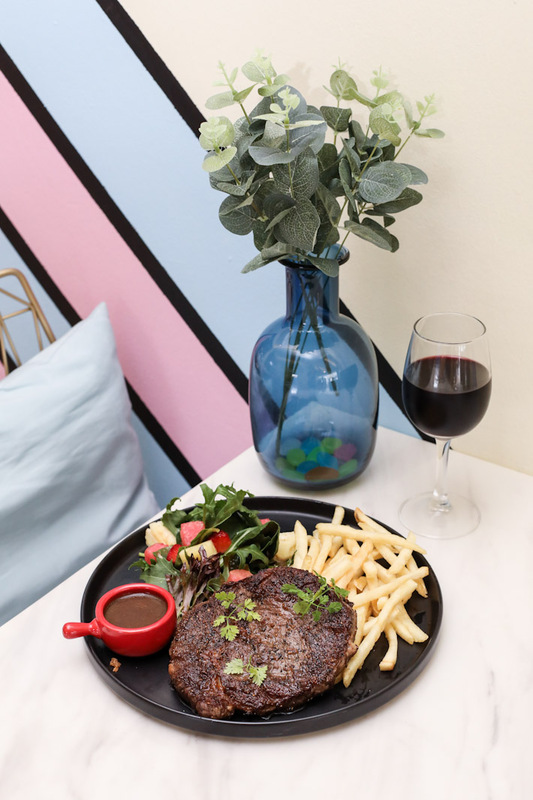 During lunch hours from 12pm to 3pm (except on public holidays), FFL offers a set menu consisting of a drink, salad and main for only S$10.90++. For the alcoholics, you’d also be glad to know they have daily beer promotions. The most bang for the buck ones being Wednesdays for students, with beer towers at only S$39 (U.p. S$49–53), and Fridays with two towers going for S$89! Worth it! This post was brought to you by Fresh Fruits Lab.